This new partnership is good for Yahoo. But better for Twitter. Yahoo may be slow to the social game, but the portal is frantically trying to catch up. Yahoo integrated Facebook functionality into its sites at the end of 2009. And this week comes the announcement of a similar deal with Twitter. But there is one big (and important) difference for Twitter. 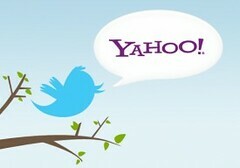 Yahoo will be paying the microblogging company for its services. For a hotshot upstart like Twitter, that is exactly what it needs right now: reach and revenue. well and good, but the microblogging company needs to ensure that its functionality is not usurped by other digital players. And deals like this are the key to keeping Twitter on the top of the real-time data pile. Twitter functionality will soon be a part of Yahoo’s major properties, from Yahoo Mail to Sports, News, Finance and Search. Hilary Schneider, Yahoo’s EVP of Americas, said as much last week at paidContent 2010. Yahoo is hoping that integrating enough functionality on its sites will help get users to start and organize their digital interactions with the company. For Yahoo, Twitter is one piece of that puzzle. But for Twitter, becoming a part of a network like Yahoo’s brings exposure, the potential for new users, and much needed cash. If Twitter wants to get beyond the barrier of tech nerds into the daily habits of the general populace, it needs to put itself front and center where people access the internet every day. Yahoo, Google and Bing are great entry points for that. And if Twitter can get Yahoo to pay for access to its users, all the better. Twitter: was there a Ross / Fry effect? Already enjoying strong growth in the UK, many were predicting that the service would go mainstream after getting after exposure on the Jonathan Ross comeback show last week. Well, it seems that being discussed by Ross and Stephen Fry has had a significant impact on Twitter’s traffic. Which UK e-tailers are still making users register? Making people register before they can make a purchase is a needless obstacle to put in front of customers, and has been shown in various surveys to be something that web shoppers dislike, and cite as a reason for checkout abandonment. Plenty of retailers are still insisting on customer registration though, despite the potential for reducing abandonment rates and increasing profits by removing this step. Video and mobile search, as well as marketers’ increased willingness to pay a premium for behavioral targeting and mobile search, are going to propel the search industry forward, according to the 2008 State of the Market survey of advertisers and agencies by the Search Engine Marketing Professional Organization (SEMPO). Seventy-five percent of the 890 search engine advertisers and SEM agencies SEMPO polled say they’d pay more for clicks behaviorally targeted to in-market consumers. On average, advertisers say they’d pay 10 percent more for dayparted and demographic segmenting, and 13 percent more for behavioral search targeting.